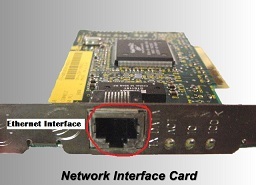 NIC or network interface card or network adapter, LAN adapter is an important hardware requirement for connectivity . Actually this interface card provides us the 'gateway' through which data from one computer A can be transfered to another computer B. Its somewhat the same as normal gate that we use in daily life to enter and exit. NIC is OSI layer 2 device (DATA LINK LAYER U can see this for more osi blog) . its consist of factory fitted 48bit address similar to that of ip address, here its called the MAC address or the Media Access Control address which is in .human-friendly form, is represented in six groups of two hexadecimal digits, separated by hyphens (-) or colons (:), in transmission order. the last one is not used much now days. One important point to be noted about the MAC address is that " each system has a unique MAC address in an LAN ,but not universally as IP address". 10/100 Ethernet--they are able of speeds up to 10 or 100 megabits per second, not to be confused with megabytes per second(Even i did the same mistake in my final Sems). Gigabit Ethernet--Gigabit Ethernet NICs give network transfer speeds of up to one Gigabit per second. NIC is just another peripheral devices attached to a system and transfers data similarily. its might use DMA or Polling or INTERRUPT .